Xypex | Salmon Bay Sand & Gravel Co.
For more than thirty years, proprietary Xypex Crystalline Technology has set an international standard of excellence in concrete waterproofing. Backed by a distribution and service network in more than seventy countries, our diverse and reliable product line is available wherever and whenever you need it, including Salmon Bay. 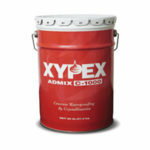 We carry Xypex’s complete product line including the concrete admixes. Xypex Concentrate is the most chemically active product within the Xypex Crystalline Waterproofing System. When mixed with water, this light grey powder is applied as a cementitious slurry coat. Xypex prevents the penetration of water and other liquids from any direction by causing a catalytic reaction that produces a non-soluble crystalline formation within the pores and capillary tracts of concrete and cement-based materials. 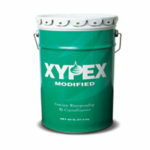 Xypex Modified can be applied as a second coat to reinforce Xypex Concentrate, or applied by itself to dampproof the exterior of foundation walls. Applied as a second coat, Xypex Modified chemically reinforces Xypex Concentrate where two coats are required and produces a harder finish. Where dampproofing is required, a single coat of Modified may be used as an alternative to a spray/tar emulsion. Xypex Admix C-500/C-500 NF is blended into the concrete mix at the time of batching to waterproof and protect concrete from the start. It outperforms other methods because of its unique ability to become a truly integral part of the concrete matrix. The Admix C-Series has been specially formulated to meet varying project and temperature conditions. Xypex Patch’n Plug is a specially designed, fast-setting, non-shrink, high-bond-strength, hydraulic cement compound for concrete patching and repair. Patch’n Plug stops flowing water in seconds and is used to seal cracks, tie holes, and other defects in concrete. 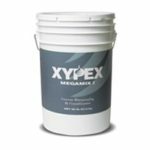 Xypex Megamix I is a thin coat for the waterproofing and resurfacing of vertical masonry or concrete surfaces, as a cap coat for Xypex Concentrate, or as an architectural rendering. 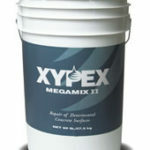 Xypex Megamix II is a thick repair mortar for the patching and resurfacing of deteriorated concrete. Xypex Restora-Top products are designed specifically for the repair and rehabilitation of horizontal concrete surfaces such as warehouse floors, bridge decks, roads, curbs, and walkways where the repaired area must be returned to normal service within two hours of the completed repair. Xypex Gamma Cure is a curing agent designed specifically for Xypex crystalline waterproofing products. Gamma Cure may be used as an alternative to water curing for certain Xypex applications. It is also used to accelerate the XypexCrystallization Process. Xypex Xycrylic Admix is a water-based, high solids, polymer dispersion specifically designed for fortifying Portland cement compositions. This liquid is milky-white in color and improves curing qualities, enhances bond, imparts excellent water and weather resistance, and reduces shrinkage cracking. Xypex Quickset is a water-soluble liquid blend of silicates, neutralizers and penetrating agents specially compounded to harden, dustproof and seal the surfaces of fresh or newly cured concrete floors. Applied to the concrete surface, XypexQuickset penetrates into the capillaries of the concrete substrate and chemically reacts with the free lime and calcium carbonate to form a hard, insoluble gel within the pores.